In November 2012, Mrs. Shelly Jenkins of Orlando, Florida wrote to me about a Costantino Proietto painting that she had recently inherited. Her great, great aunt, Ms. Marian J. Fortune of Brevard, North Carolina had died in May 2012 at age seventy-nine. 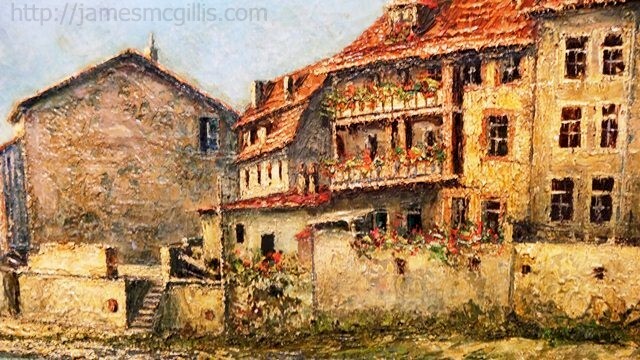 In her will and bequeathed to Shelly Jenkins was one of only two known Costantino Proietto original oil paintings of Bad Kreuznach, Germany. The other features the medieval and marvelous bridge houses, built over the Nahe River. For eight years during the 1950’s and 1960’s, Ms. Fortune was a Physical Education Teacher for the U.S. Department of Defense School for American Dependents, in Bad Kreuznach. After World War II, the artist exhibited his paintings at Allied bases and later at NATO base post exchanges. 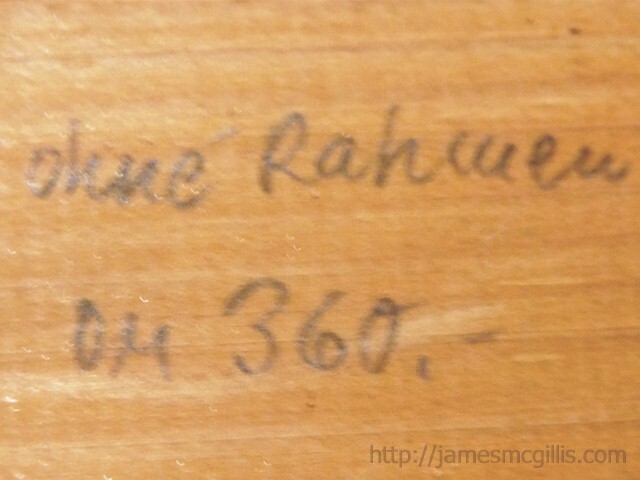 On the back of this painting reads, a “DM 360.” pencil marking might represent a price of 360 Deutschmark. According to cousin, Nunzio LoCastro, as early as 1951, a Costantino Proietto’s painting could command a price of 200 Deutschmark. 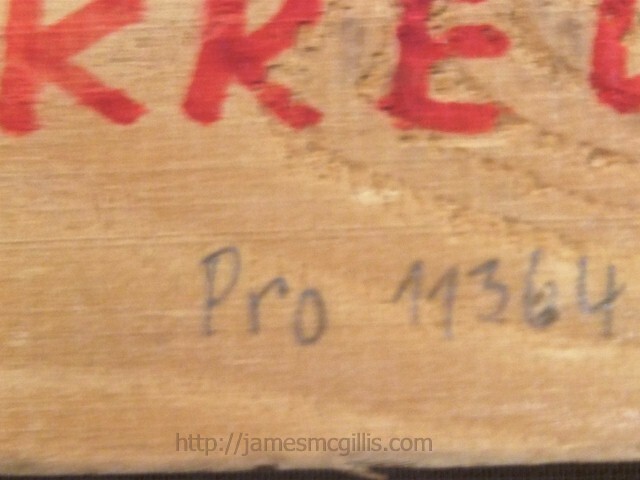 If Marian Fortune was in Bad Kreuznach in 1964, the “Pro 11364” pencil marking on the back might represent a purchase date of November 3, 1964. With inflation and ongoing recognition of the artist’s work, DM 360 would be a reasonable price for a 40” X 20” C.Proietto original oil painting at that time. If such was the case, it is likely that Costantino Proietto himself sold this painting to Ms. Fortune. After all, Bad Kreuznach and the artist’s studio in Stuttgart were little more than two hours away from each other. The tag and wax seal affixed to the back of the painting are consistent with his other 1960’s works. The 40” X 20” (a 4:2 aspect ratio) is similar to other Tino Proietto 1960’s “CinemaScope” style paintings. Most of his earlier works had a 4:3 aspect ratio, which is similar 35-mm film. The flattened horizontal lines within the artist’s signature are consistent with his later works, when his signature became more stylized. Although many C.Proietto landscapes display a romantic or timeless quality, to my knowledge the artist painted only real places. 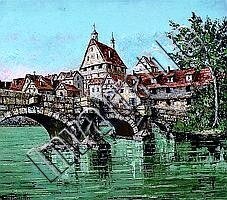 Although I am not aware of its exact location, the painting probably depicts a river scene in Bad Kreuznach. Since the artist worked from both photographs and sketches, this painting may have originated from either or both of those sources. Even when darkened with dust or soot, Tino Proietto’s paintings age with grace. Although there is some darkening in the sky and several small chips or spills on the canvas, a good technician could remove those without damaging the overall piece. Older canvases may be dry and brittle, so avoiding impacts to their surfaces is especially important. By mixing cigarette ashes into his pigments, Costantino Proietto often “pre-aged” his paintings. For that reason, I would not suggest a full-scale restoration of the painting. Doing so may destroy more value than it creates. Looking at the back, frame construction appears to be of particleboard, which was inexpensive at the time. In order to bring out the full beauty of the painting, I suggest a professional re-framing. The framer should use extreme caution while separating the canvas from the frame. Upon separation from the frame, some long-dried paint may lift from the canvas. 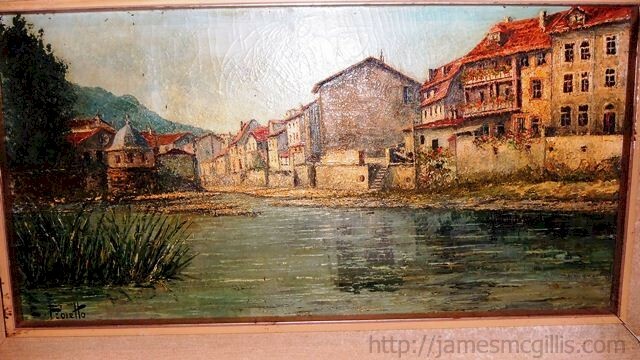 This painting of Bad Kreuznach exhibits Proietto’s penchant for foreground (water grasses), middle ground (various buildings) and then a fade into the background (mountains/sky). 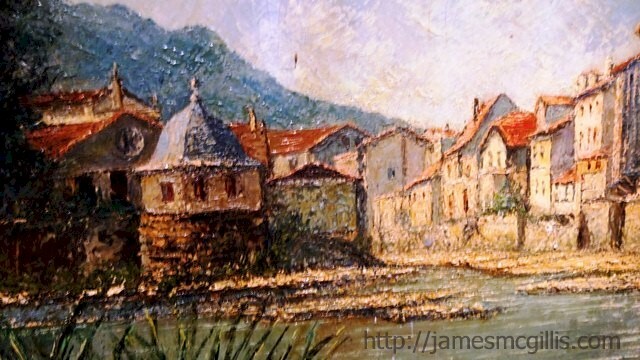 The two red-tiled buildings in the upper-right and the blue-roofed building on the left received a heavier dose of impasto (palate knife) technique. Note the red flowers on the balconies and walls. Almost every C.Proietto landscape features red flowers somewhere in the canvas. Also, note the realistic appearance of the buildings in the center of the painting. 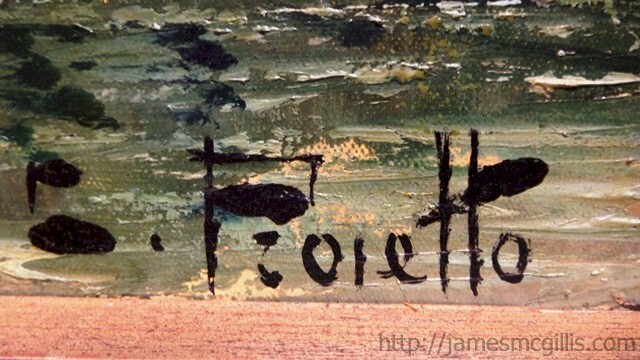 Close inspection shows that the artist used very few strokes to create the effect. To see a C.Proietto painting in all of its glory, I suggest good natural light and a viewing distance of about ten feet. As with each C.Proietto I have ever seen, this is a timeless and beautiful painting. As a collector of the artist’s work, I pictured it hanging on my wall. After I made an offer to purchase the Jenkins Family C.Proietto, Shelly Jenkins wrote back, saying, “We were so thrilled when we heard that Marian Fortune willed the painting to us. We did not get much opportunity to visit with her during her lifetime and her thought was memorable”. Although Shelly Jenkins would not sell her C.Proietto mid-century masterpiece, I thank her for offering to share her painting with the world.